60% of organisations state that making better use of customer insights, trend data and information in and around their business will be the key to unlocking the next wave of growth, according to the Big Data League study from EMC UK today. The study of 300 business and technical decision makers across UK enterprise and the public sector reveals that despite recognition of the big data opportunity, businesses in all sectors are struggling with skills and infrastructure challenges. Just under half (45%) of businesses have no data analytics platform experience while 62% are without the skills to understand ethical, responsible and compliant use of customer data. Alongside the skills shortage, 42% of all respondents state that IT infrastructure limitations are holding them back, with 44% of financial services decision makers unable to flex infrastructure fast enough to make better use of data. Skills: The availability of data science and analytical skills/tools to transform data into insight. 38% of businesses are recruiting data scientists or business intelligence experts. 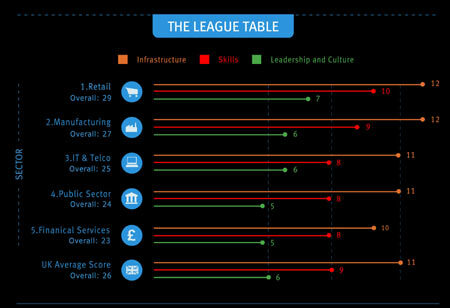 *To calculate the EMC Big Data League table, for each respondent a score was allocated according to their responses to each question in three areas: leadership and culture, skills and infrastructure. The scores were added up for each respondent across the three areas as well as a total score. These individual respondent scores were then averaged across the 5 industry sectors reviewed in the research (Finance, IT, Retail, Public Sector and Manufacturing) to give an average score for each industry in each of the three areas as well as overall. These averages were then put into a league table to deduce which industries fared the best and worst in each area and overall when it comes to their companies use of big data. Steve Duplessie, Founder and Senior Analyst, Enterprise Strategy Group Inc.